In 1958, local scholarship opportunities for St. Joseph County high school seniors were scarce. To address this area of growing need in the community, area civic leaders and Chamber of Commerce members came together to develop a solution, and The Scholarship Foundation of St. Joseph County, Inc. was formed. Our purpose today, as in 1958, is to raise scholarship funds and award them through an objective application and selection process based on academic performance and financial need. 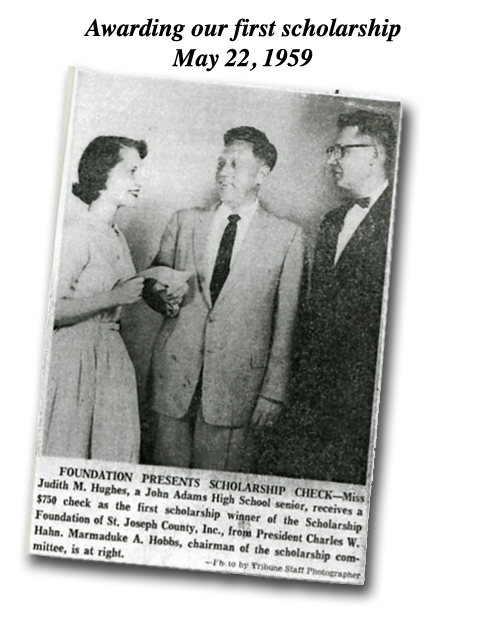 In the 56 years since awarding our first scholarship of $750 in 1959, the Foundation has provided nearly 4400 awards totaling in excess of $4.7 million in scholarship assistance to St. Joseph County students. The Foundation is also a founding sponsor of the area’s largest IACAC-sanctioned College Fair. Now in its 38th year, this popular event is held annually in early October and provides area students and their parents with the opportunity to speak to admissions representatives from over 80 colleges and universities from across the country. The Foundation is incorporated as a 501 (c)(3) non-profit organization. We are privately funded through personal and corporate contributions, bequests and memorial gifts. Managed by a local volunteer Governing Board, we’re dedicated to being good stewards of the scholarship funds entrusted to us. To that end, we employ just two paid staff members to lead our development efforts and manage the day-to-day operations of our office. Our endowment portfolio is professionally managed for growth and safety by a prominent local trust department who provide us with a discounted rate for their services. This continual emphasis on minimizing administrative and portfolio management costs while closely monitoring endowment performance allows us to maximize available scholarship funding for our local students. Our Mentoring Board is responsible for administering our scholar mentoring program. Numbering nearly 72 local directors at any given time, these current and retired professionals represent a wide range of professions and decades of experience to be shared with our students.